Many women with Polycystic Ovarian Syndrome (PCOS) suffer from an excess growth of facial, back and chest hair. This symptom may cause emotional distress and lead to depression and severe self-esteem issues. This article aims to look into the different options of long term hair removal treatments that currently exist for women with excess hair growth (also called hirsutism) caused by PCOS. PCOS is a syndrome that affects the natural balance of hormones in the female body. The main symptom of PCOS is usually the appearance of small and multiple cysts on the ovaries, but this is not always the case as some women never develop cysts. Hirsutism is a condition where a “male pattern” of hair appears on a female body, most often on the face, chest and back. This hair tends to be thicker and coarser than typical female body hair. PCOS symptoms can sometimes be managed naturally with diet and exercise; birth control can be used to regulate menstruation, fertility medication to manage ovulation, insulin resistance treatment to avoid an onset of diabetes later in life and hormone therapy medication can be used to help reduce the growth of unwanted hair. Hirsutism is not only related to PCOS, it can appear in other circumstances, but it is one of the most visual and common symptoms of PCOS. Scientific studies show that 70-80% of women with PCOS also have issues with excess hair. While it can sometimes to be treated naturally with diet and weight loss, this is not always the case. Hirsutism can be a cause of a lot of emotional distress in women, causing severe self-esteem issues and depression. While non-permanent hair removal aids can help on a short term basis; these are simply aids and not a treatment. There are more long term medications that have been developed to reduce the growth of excess hair caused by PCOS. These treatments can be used in conjunction with semi-permanent and permanent hair removal treatments for a more long term approach. There are many hair removal products on the market, but some are more effective than others, especially if you have PCOS and are looking to get rid of the thicker excess hair that often comes with the syndrome. The consumer’s desired outcome will determine which product(s) to use. While shaving and depilatories are effective immediately with minimal side effects (small risk of irritation and/or folliculitis), regrowth usually happens within a day or two, and it is not advised for women to use razors to remove facial hair. Waxing and plucking have longer term effects, but take more time to apply, are more painful, and still do not provide a more permanent solution. Electrolysis, laser treatment and Intense Pulse Light (IPL) treatment can provide a more long term, possible semi-permanent or permanent, solution, but are more costly and come with more potential side effects. Click here to learn more about electrolysis and here to learn more about laser hair removal. Certain birth control medications exist to reduce the excess of androgens naturally created by the body and therefore reduce the growth of excess hair, but, in order to see a possibility of change with this type of birth control, months of treatment are required, and any changes are immediately reverted once treatment is stopped. In conjunction to these birth control pills, most women with PCOS can take hormone therapy medication to balance the creation of androgens in their body. It is not recommended to take any hormone therapy medication without birth control as one should not risk pregnancy while taking them (possible birth defects from treatment are a risk). These treatments are therefore not possible if one wishes to conceive or is pregnant. Lastly, there is also a prescription cream available, Eflornithine cream (Vaniqa®), that can be applied topically to the face and neck, and which helps slow hair regrowth significantly. This cream can also be used in conjunction with other hair removal products for a more significant return, as there have been no registered side effects registered with this type of usage during clinical trials. Eflornithine was initially developed as an anti-cancer drug. Hair loss was found to be a side effect during clinical trials and from this observation Vaniqa® was developed. Vaniqa® remains the only prescription drug on the market that has been proven to reduce and slow the growth of unwanted facial hair in women. With only a small risk of side effects (stinging or burning sensations, mainly when used on skin with abrasions), and with the fact that it can be used in conjunction with other medication (birth control pills, hormone therapy treatment), and all types of hair removal tools, Eflornithine cream (Vaniqa®) is considered to be a very helpful aid in reducing the appearance of hirsutism in women. Note: It is always recommended to consult with a doctor who is aware of your PCOS condition before starting on a treatment or a group of treatments against unwanted facial or body hair. 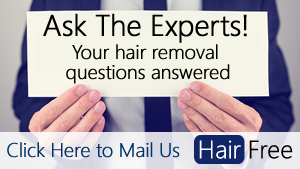 As the excess hair is usually thick and coarse, it is often necessary to try different methods before finding the one that works for you. While a combination of Eflornithine cream (Vaniqa®), birth control and diet may work for one woman, another may find that Eflornithine cream (Vaniqa®) and laser treatment works better in the long term. It is also important to know that Eflornithine cream (Vaniqa®) is considered a pregnancy class C drug, which means there are potential risks to the fetus if used when pregnant (adverse effects were recorded in animal studies, no real proof in humans studies yet). Diet, exercise, insulin resistance drugs, birth control, fertility treatment, Eflornithine cream (Vaniqa®), and long term hair removal products (electrolysis, laser treatment and IPL) all help towards the long term reduction and removal of excess hair growth in women with PCOS. It is up to the patient and her doctors to find the combination of treatments that work best for her. Electrolysis, laser treatment and IPL have all been proven to be effective in semi-permanent and permanent hair removal. These treatments are more costly than temporary hair removal treatments and are usually only effective over several, frequent treatments, but the end result is much more effective. These treatments can also be painful. Laser treatment only works on darker hair, which is great for those with the dark, coarse hair that often comes as a symptom of PCOS, but not so much on finer, light hair. Laser treatment and IPL are performed on a section of skin at a time, but also need several repeat treatments before any results can be seen. Nowadays laser treatments done by a physician in a clinic can be performed on lighter and darker skins, but home laser treatments can also only be performed on people with skin tones I-IV on the Fitzpatrick skin scale (see our article here for more information on using laser hair removal with dark skin). Electrolysis is performed on a hair by hair basis and it can take many appointments for the treatment to actually show its fruit, which is why it is best contained to smaller areas, like the upper lip and chin. All three treatments come with a risk of potential adverse effects, such as the scarring and changes in the pigmentation of the skin, which is why it is important they are done by a physician to reduce the possibility of these risks. While the cost and potential of adverse reactions may seem a little off-putting at first glance, clinical studies have proven that laser treatment is the most effective treatment in removing hair at least semi-permanently, and in conjunction with the daily application of Eflornithine cream (Vaniqa®) hair growth can be reduced significantly. One clinical study that took place on 54 women with PCOS-induced hirsutism required each woman to apply Eflornithine cream (Vaniqa®) on one side of their faces and Eflornithine cream (Vaniqa®) combined with regular laser treatment on the other side, for over 34 weeks. The conclusion of the study showed that the side with the combination of both treatments promoted more rapid hair removal and a slower regrowth of hair in the area than the other side did, while both sides showed a significant drop in the hair regrowth rate. In conclusion, there are different combinations of long term hair removal treatments available for women with PCOS. Clinical studies show that a combination of treatments, such as Eflornithine cream (Vaniqa®) and a long term hair removal method such as laser treatment have the best results. However, before starting on any treatment it is always best to consult with a physician to figure out which treatment or combination of treatments will work best on a case by case basis.